EB-5 has been mandated by the US Government and is the category of Green Card, which is open to all immigrants, who can invest and migrate to the USA within 2 years. Presently, it has become a great challenge for foreigners to obtain permanent residency in the USA. President Trump has tightened the Visa rules. In addition, Indian individuals experience returning to the earlier state of the process, regarding their visa priority dates. The US Government, by implementing, strict Visa rules has made obtaining non-immigrant employment visas more difficult for Indians. They are subjected to wait for 10-15 years. Through the EB-5 category, a great opportunity has arisen for foreign nationals to obtain their Immigrant Visa status within two years. Many Indians desire to fulfill their American Dream but most are caught up by lack of an employment or family sponsor. The persons who receive the sponsorship have to bear the agony of a long waiting period. 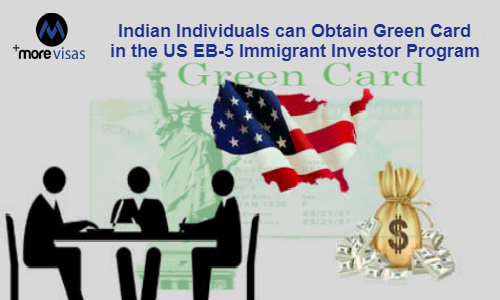 Many Indians are not aware that they can explore to get the Government mandated EB-5 visa, in the Immigrant Investor Program. It is an ideal answer, for innovative Indians, and their investment can help them, to get the Green Card for the applicants, and members of their family, like spouses and children below 21 years of age. The aspirants of this program are required to meet the specifications laid out by United States Citizenship and Immigration to obtain permanent residency. The investor must make a capital investment of $500,000 or $1 million capital into a US commercial enterprise. It must create ten jobs for the local Citizens, to get the necessary qualification for the EB-5 program. Once all requirements are fulfilled successfully, and also approved by the USCIS, the path becomes easy. In the EB-5 program, a conditional Green Card will be given within 15-18 months of submitting applications/making investments. When the visa conditions are fulfilled, in two years, the permanent green card is given after two years. The holder of the Green Card is eligible to apply for US citizenship, after completion of five years. The government takes consideration the employment opportunities generated by this program. Close to 1000 Indian entrepreneurs have obtained permanent residency, using this route. Its popularity is increasing, and now India is the third largest country, to opt for this program, next only to China and Vietnam. Among the Indian entrepreneurs, high net worth Individuals and professionals, take advantage of this program. Nearly 20,000 investors from across the world have invested in the EB-5 program in 2017.